This book is to teach you how to be a good Time Manager. Productivity hardly comes without a good Time Management skill. Play with Time Management, and the noblest of all Projects will fail woefully. In this book, you will be taught how to be a good Time Manager. You will be taught 5 proven Time Management Skills that would be of a great benefit to you in this life. 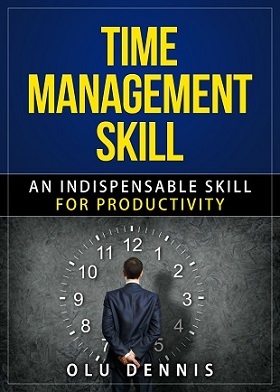 This book is packed with practical illustrations of how to apply Time Management Skill to carry out any Project successfully. What is Time Management? Time Management is the breaking down of a Block of time into segments [or smaller blocks] to be allocated with activities, task or project to be carried out within each of these blocks of time. I have a Block of Time within my disposal, [24 hours, 1 Week, 1 Month, 1 Year] and I break it down into segments or blocks of time, then allocate activities, task or project to be done within each of these blocks of time. That is what Time Management is all about. I have heard, read and seen so many MD, CEO, Founders of an Organizations, Individuals who want to be productive in what they do, but couldn’t. Many individuals want to be productive in life; they want to accomplish much in life within a specific period of time, but they couldn’t. Why couldn’t they? Many of these people don’t know the secret of productivity. Many books on “How To Become Productive” juggle things together and make it more or less like an MBA course stuff. To pass a School Exam is quite different from passing a Life Exam. School Exam relies on, remember what I told you and bring it in the Exam. Life Exam relies on, do what I taught you, and do it to get the result I told you it will produce. So my goal here in this book is to tell you, if you want to be productive in life or in whatsoever thing you are doing: Time Management and Project Management skills are the 2 life skills that you need to acquire and do them. I will dwell much more on Time Management skills with reference where necessary to Project Management skill. The real truth is that, you can’t learn Time Management skill without understanding what Project Management is, because they are interrelated and interdepended. The book will worth your attention and investment and it will deliver its promise – To teach you how to be a good Time Manager. WHY NOT GIVE IT A TRIAL.